I should say that although there were English subtitles, they were sporadic: enough to keep the plot hanging together for me, but with large gaps filled with dialogue between. So I may have misunderstood some of what happens, but I think my general sense of the film is fairly accurate. One day he brings Karan home a bunch of new toys and orders the old ones thrown away. Karan is very attached (as children are) to his toote khilone (broken toys) but that doesn’t matter to his father, who has them burned. 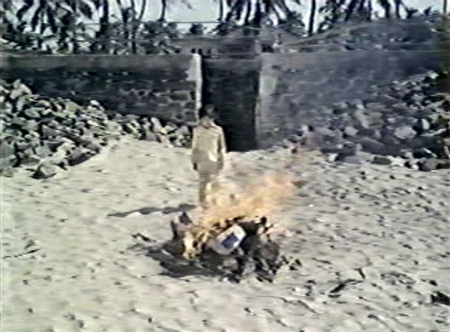 My favorite song (“Nanha Sa Panchhi Re Tu”) in the film follows this scene. I just love it, love the tune, love the lyrics (what I could understand of them)…love it. I guess another later song called “Maana Ho Tum” was the popular song at the time, but I like this one better. And although I generally like pre-disco Bappi Lahiri music, most of the other songs in this aren’t that great (and he “borrows” heavily from other people’s work). Karan (now Shekhar Kapur) grows up to be a charming and sensitive young man, chafing at the oppressive restrictions which still bind him but afraid of his father. He puts in an application to join the Merchant Navy and see the world, but Pratap uses his influence and power to put a stop to those ambitions. He further tells Karan that he is throwing a party for his business associates, and that he expects Karan to marry the daughter of his colleague Mr. Jain. But Karan finally finds the courage to break free when his father instructs his manager Devendra (Bharat Kapoor) to pay off the elderly and now deaf Sushila and get rid of her. 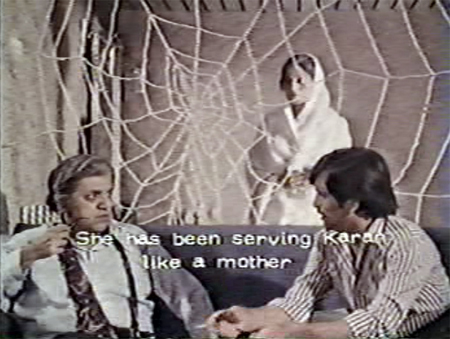 I am not sure what the giant cobweb decor is about, whether it is supposed to be symbolic of Karan’s entrapment or Sushila’s dwindling housekeeping skills, but never mind. Even Devendra protests at his employer’s callous instructions, but Pratap is implacable and Karan says a sad goodbye to the only person who has ever shown him love. That evening he shows up at the party dressed casually and insults the guests, particularly Jain’s daughter Pramila. In the confrontation with his father which follows Pratap predictably lists everything he has done for Karan—but Karan is not having any of it. He’s not wrong! 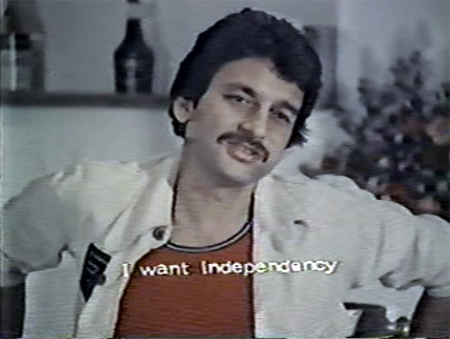 He tells his father that he wants independence. His father predicts that he’ll come crawling home one day when he gets tired of poverty and when it happens, he says, he will welcome his son with open arms. Karan answers that his father will grow lonely with only money to keep him company and that then he will coming crawling to his son—who will welcome his father with open arms too. And he leaves, taking nothing with him. This is picturized rather startlingly as Karan catapults himself through a flimsy cardboard clock and then flings himself about singing “Bandhan Kat Gaye” with some…well, clock people, I guess. He sleeps the first night in a compound which turns out the next morning to be a hub of cotton-trading activity. On an impulse he makes a trade, which nets him 50,000 Rs. He uses the money to buy a small house and a hearing aid for Sushila (he also gives her what money remains), and asks her to move in with him. 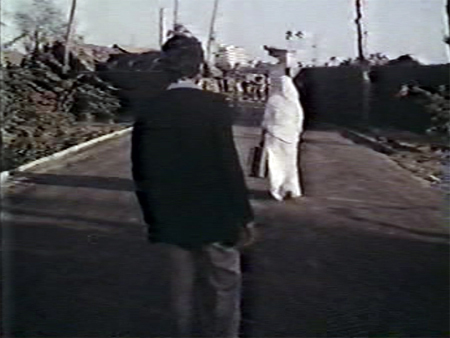 She gently refuses, telling him that he should go home to his father. Elsewhere, a pretty young woman named Shobha (Shabana Azmi) is working in a typing pool, and has caught the lecherous eye of her boss. He offers her a lift home that night after a work party and assaults her on the way. When she puts up a fight he shoves her out of the car and drives off after telling her not to bother coming back to the office. Karan comes along and as she falls unconscious (having hit her head on a rock) he picks her up and takes her home. She is grateful the next morning when she wakes up, and they bond over tea (he steals his neighbor’s milk and morning paper). An attraction is clearly and immediately visible between these two lonely souls. Shobha is an orphan and very reserved by nature. Karan’s blithe spirit—he is truly embracing his newfound freedom—draws her to him. To make ends meet, the two of them embark on a series of scams and minor thefts. This disappoints me, because the message seems to be that with freedom comes irresponsibility—and I don’t think that is true. It’s possible to be a free spirit without breaking laws and hurting other people! Bhanu Pratap has assigned Devendra the task of following Karan and reporting back. He now learns that Karan is “living with” a girl, and looks into her background. Sushila—whom Karan visits regularly—encourages Karan to make an honest woman of Shobha, although Karan is not inclined to do so. But when his father visits and tells Karan that she isn’t fit for him (her father having been a known drunkard, rendering her mother an “awara”) Karan is defiant. He further antagonizes Pratap by showing up with Shobha to perform at one of his business luncheon meetings—a meeting attended by most of his business associates including Jain and his daughter. Pratap has told his colleagues that Karan is in America studying. 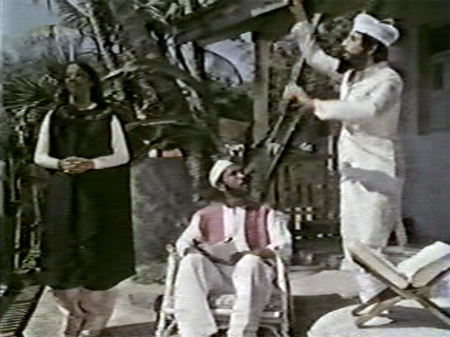 This is a very bizarre scene, as Shobha and Karan put on a surreal magic show followed by a song with candy-colored backup dancers. 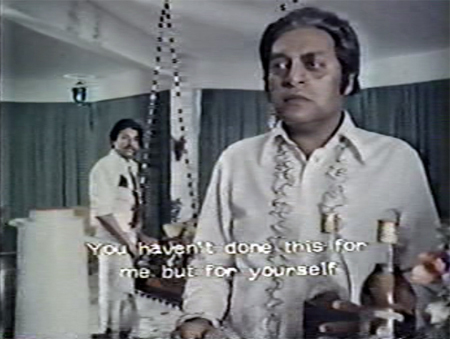 I’m sort of with Utpal Dutt on this, and the look on his face makes me giggle. I think the intent of this crazy scene was partly to reflect Karan’s playful spirit—but I’m beginning to find Karan unsympathetic, as he continues to treat people and their property with complete disregard. 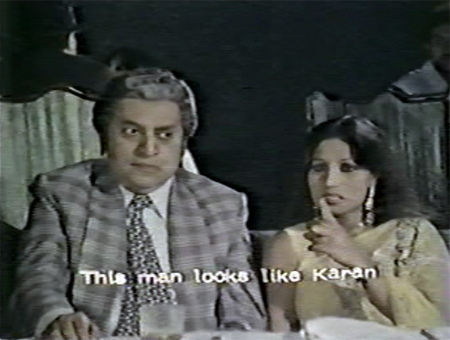 A young newly-returned (to India from “abroad”) businessman named Rakesh who sees her performance at the lunch is attracted to Shobha. When he runs into her a few days later, she and Karan conspire and steal his car as thanks for his polite interest in her. But Shobha begins to feel the same exasperation as I do when Karan next begins inviting random strangers to stay with them. She is expected to cook and clean up after them, and she is a little suspicious of these people too. She is also growing tired of Karan’s inability to make any commitment to her. She has fallen in love with him and wants to settle down, but he puts her off whenever she brings it up. 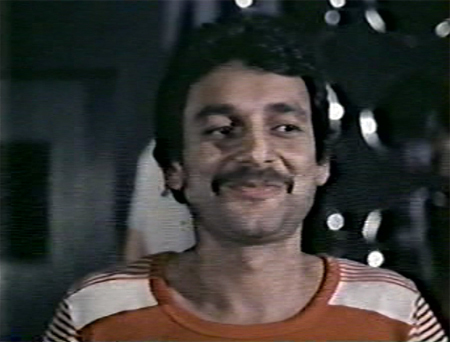 Then nice Rakesh shows up again too, and doesn’t hold the little car theft incident against her. Will she find happiness with someone else? Will Karan ever grow up and take responsibility for his life? Or will he continue in his wayward habits? Will his father come to realize that money isn’t everything? Who will come crawling to whom? Can it possibly end happily? Well, it takes a long time to get there, and there is a lot of weirdness along the way. I guess I wanted this film to be a little more serious about its subject; as it is, I was never quite sure what the filmmakers were trying to say. 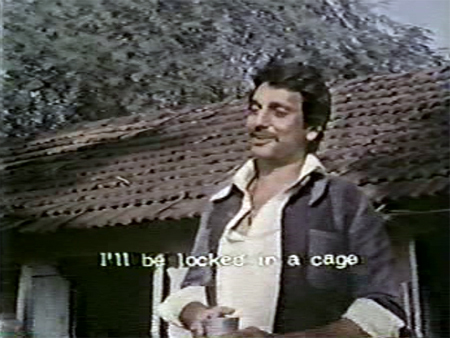 It’s as confused and muddled as Karan himself—possibly part of that for me that the subtitles began to disappear altogether towards the end. 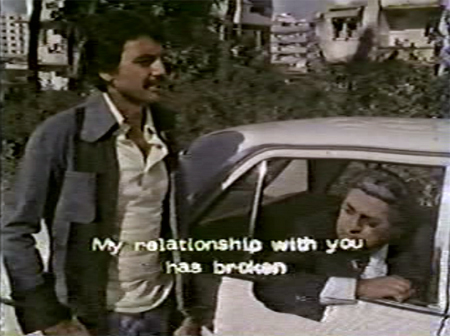 Although Shekhar Kapur brings an impish charm to Karan, self-absorbed man-children with Daddy issues just aren’t really my thing and I eventually found it impossible to root for him. Mr. Kapur has said himself somewhere that he wasn’t that good an actor; I agree somewhat although certainly he did well in places (and the other cast members were fine, as you would expect). Had the story continued as a sensitive and probing look at the consequences of bringing up a child in restrictive and oppressive circumstances it could have worked beautifully. But for me it lost its way as events became increasingly nonsensical. Although some of them were enjoyable as individual scenes, they didn’t mesh well with as a whole and eventually took over and killed what could have been a good psychological drama. Still, it is an interesting attempt at something different and it’s good fun to see the luminaries who populate it early on in their careers. Certainly someone involved should find a good print and put it on dvd with proper subtitles! I’d watch it again for sure if that ever happens, to see what I missed. Posted on October 6, 2010 at 3:47 pm in Hindi movies	| RSS feed You can skip to the end and leave a reply. You know, it’s the little details like the giant cobweb (the first thought I had when I saw that screenshot was that wow, their servants don’t really dust very often, do they?) 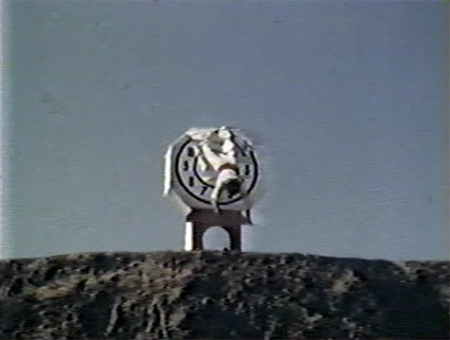 and the clock dance with the clock people (I presume they’re upset he destroyed their home?) 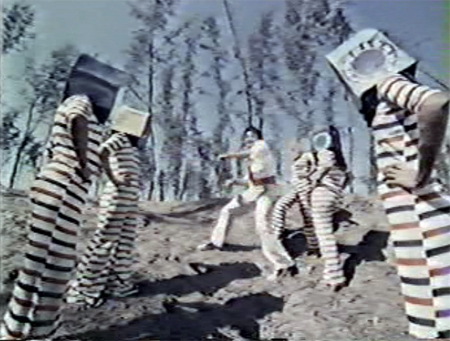 that make me sad that nobody has ever made a true-blue Bollywood masala movie as a Fellini fever dream. Can’t you just imagine the possibilities? You r welcome!! Memsaab and thanks to you for watching and spending your precious time for writing review on rare movies of Bollywood like Toote Khilone.1978 was big B’s years with AAA,Don,Suhaag,MKS etc so no one notice about this movie.Only one song”Maana ho tum” is famous till today,but still I like this movie and only want to share with someone who love hindi films crazy like me. I am Happy!!!! to know that my dvd reached in right hands. So, Maana ho tum is from this film! I remember watching the song on Chayya Geet years ago. It was quite common with the 70s alternative-mainstream cinema to be very confusing as to the message and not be really consistent with the character traits (well, there are really very few films which are true to this). If he was so good at the cotton business to earn Rs. 50,000 on his very first day, why doesn’t he continue with it? I see no point in getting into scams and jugglery! Sounds definitely like a film which I won’t dekho! Well, he wanted to break free from his father and all the constraints of wealth and business. That I could understand, and also why he gave it all away…but I wish he had instead tried to do odd jobs for money instead of robbing other people. Although he does foil a bank robbery later on…but yes, it’s all very inconsistent. I would watch it again for sure if it’s ever put out with good subtitles so I can truly understand the nuances in dialogue and what’s going on though. I love love love to watch this movie, complete with all the surrealism- me thinks someone had watched the clockwork orange (freedom) and wanted to make a statement, sans the extreme violence- and ended up doing a bad job of it. Being an accountant, I like ur comment to Shashi below. Yup we accountants are the repressed creative types- heeh. The soulful, heartbreaking “nanha sa panchii re tu” AND a dance featuring clock people all in one film?! How can one not love Hindi films?! As you know, I DO love Hindi films! :) Even all the bad ones I watch cannot change my mind on that score! It is such a gorgeous gorgeous song, I love it. Maana ho tum was really popular. I was in college then. The movie flopped, and maybe because of that, the dvd makers did not want to touch it. Maana ho tum is the one thing I associate Toote Khilone with! I didn’t know anything else about it until I read Greta’s review. Thank you, Greta! I remember Shekhar Kapoor mentioning in an interview that if he appeared in a movie even for a single moment, it was deemed to be a flop. However, if he appeared in any television serial, it was deemed to be a success. I guess he formed this opinion after casting himself in ‘Toote Khilone’. I am pretty sure, if he had wielded the director’s baton himself, the movie would have been a huge success. Maybe he was still discovering himself then. Yes, I remember seeing that somewhere too. He said that he was uncomfortable with the “heroics” required in B’wood at the time—the singing/dancing and other antics. When I read somewhere that Shekhar Kapur was a Chartered Accountant before he became an actor, I thought why did he bother and then he did everyone a favour by turning director. I loved his films Masoom and MrIndia. Masoom was inspired from A Man and A Woman featuring Martin Sheen ( I hope I have got the name of the film right) but I liked Shekhar’s version better than the English one. Ha ha!!! Why do so many creative people start out as Chartered Accountants? I haven’t seen Masoom yet, I don’t think. But I do enjoy Mr. India, and liked Elizabeth as well. Who are the others who started out as CAs? The song “nanha sa panchhi” is less-known but is also lovely. I had a Yesudas cassette in those days and this song was on it. Loved it. Other than these songs and the knowledge that this movie had Shekhar and Shabana, I knew nothing about this movie till now. Thanks for the review, Greta. Going by your review above, it certainly looks like the story lost its way somewhere down the line. Appears to be a good movie. I agree with Kanu that Saath-Saath is a movie on somewhat similar lines and it’s a highly commendable movie. Sensibly made and brilliantly acted. Can anyone please help me in getting DVD or VCD or e-file of this Movie ? I will be grateful.